Our ring-tailed coati Diego is one of the most popular animals in the Nature Centre, both with visitors and staff. Diego is known for being very friendly and also very sleepy. Often you find people peering deep into his enclosure searching for him, when he’s simply tucked up asleep indoors in bed! Diego’s enclosure is in the Europe Zone of the Nature Centre, but ring-tailed coatis are from South America. Construction work has been continuing in our new Americas Zone, building a brand new, purpose-designed enclosure just for Diego. 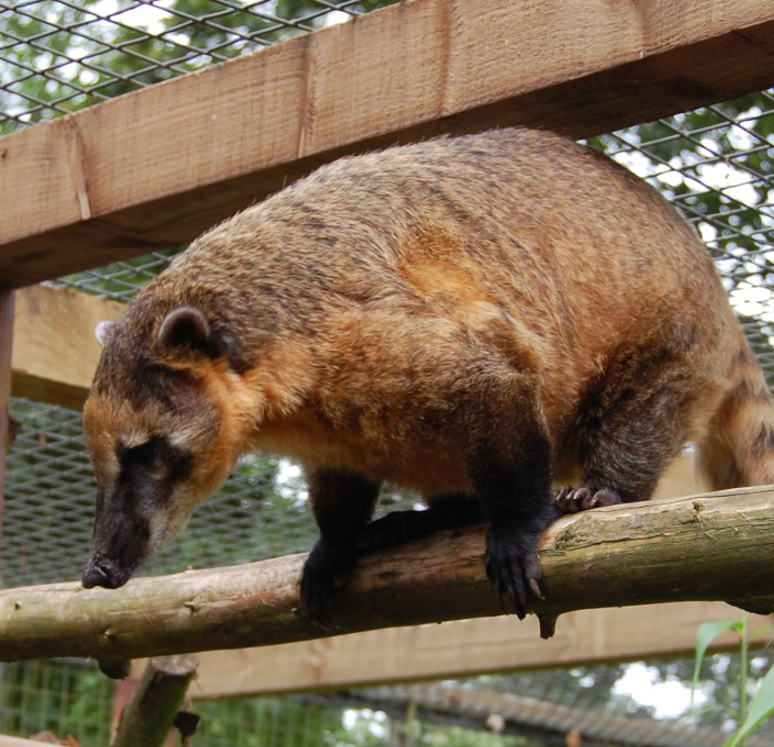 Coatis are at home on the ground and in the trees and so Diego’s enclosure has plenty of floor space for him to explore, as well as beams, branches, logs and ropes to climb. High platforms give him a fantastic view all around him, and allow his keepers to spread his food around and so encourage foraging behaviour. Best of all, his new indoors house, next door to the red-footed tortoises, is well-heated, giving Diego the cosiest bedroom he could hope for. Now, in his brand new home besides his South American neighbours like the burrowing owls, Alf the tapir, the macaws, rhea and capybara, Diego can take his rightful place as a beloved part of the Americas Zone here at Tilgate Nature Centre.